Realism is probably not the first word that comes to mind today when people think about Falcon. Quite the opposite, people are likely to think of the stylized characters, the obviously contrived and synthetic story, the “hard boiled” dialog and of course, the panoply of fedoras, shoulder-pads, shiny over-sized cars and non-stop smoking that seems (rightly or wrongly) “so ’40s.” There is no necessary contradiction between that image and Macdonald’s statement, however, for as I have observed elsewhere, nothing ages more quickly than notions of “Realism,” nothing is likelier to look dated than something which in its day seemed so terribly “real.” Indeed, a film that succeeds in seeming “just like life,” is doomed to have its stylization revealed later because as time moves on, films stand still as records of a particular moment, its attitudes and its artifacts. Which is not to say that Macdonald was wrong. Falcon does present a notably unsentimental view of its characters and milieu. Even at a level of superficial verism, the atmosphere of the film is remarkably gritty for the period. If time has tended to accentuate the relationship between Bogart and Mary Astor and the character performances of Sydney Greenstreet and Peter Lorre, Falcon is still very far from being a “cozy” mystery and further still from a romance. A recognition of greed and corruption, of human weakness, plus a contempt for both authority and sentimentality, beat in the heart of the film. In his notes, Macdonald rightly accentuates how unprecedented it was for Spade to turn in Brigit O’Shaughnessy at the end, for example. Love is one thing, but self-preservation trumps it. Even today, that attitude would probably shock people invested in the lie that “love conquers all,” assuming they took a moment to think about what the film was saying, rather than patronizing it as an antique. There are few attitudes stupider than thinking we are smarter than the past. As we sentimentalize older work, it is easy to forget that it had a resonance for its time that is difficult to retrieve through the glaze of nostalgia. Scratch the patina off some of it, however, and the hard surfaces shine through again. 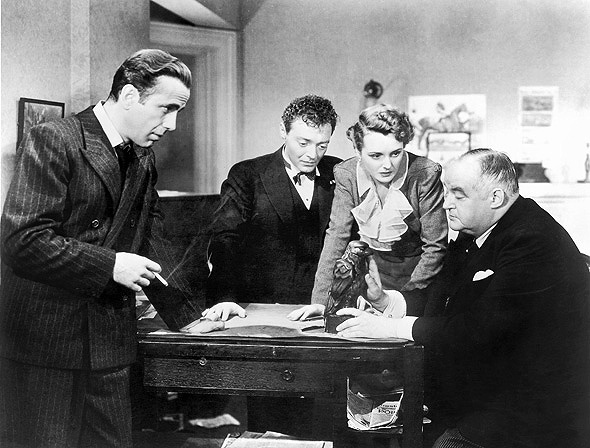 The real difference between yesterday’s popular culture and today’s is that work like The Maltese Falcon had to become camp. Today’s films are born jokes. “Trims and Clips,” in Macdonald, Dwight, On Movies, Berkeley Publishing Corporation, New York, NY, 1969. p. 494.